As a Federation of Small Business, HVCA and CHAS Accredited Contractor, Vent Logistics have over 40 years experience operating in the ventilation, sheet metal and ductwork industries, throughout Luton, Milton Keynes, Oxford and further afield. 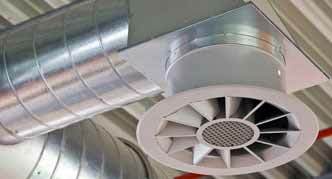 We provide complete ventilation services, including ventilation maintenance, free quotations and expert estimations. We offer a complete design, manufacture and installation package, and all our duct work and sheet metal products are manufactured and installed to the highest standards, in both ferrous and nonferrous metals. Our CSCS, IPAF and PASMA qualified and experienced engineers work to the highest specifications as set out by industry standards, including DW144, and we pride ourselves on our friendly and approachable service. Whether you are looking for a commercial or industrial ventilation system, maintenance or ductwork, we welcome you to contact our dedicated team today. For one of our experts to call you, simply complete our form below and we'll be in touch. * Information completed in this form will not be shared with any third parties. Have you used our expert services recently? We would love to hear your thoughts and feedback. You can write a review by clicking the button located just below. View the gallery of our previously installed work! One of our key commercial and industrial skills is the design, manufacture and installation of kitchen ventilation systems. Having worked on systems of these types throughout the Luton, Milton Keynes and Oxford areas, we can provide an unmatched service for clients of all sizes. Whether you require kitchen ventilation, smoke ventilation, extraction canopies and systems, fume control systems or anything in between, Vent Logistics Ltd provide an unrivalled service with a price to match. All work is fully guaranteed and insured, and we are fully compliant with all health and safety laws. For more information on our range of ventilation services or for a free quote, please contact the team at Vent Logistics today on 01296 681752. Alternatively, send your enquiry to our online contact form and we will be happy to answer any questions you may have.